-Former handgun shooting xp, not extensive long gun. -It must be a long gun. A battle rifle, sounds like something cool to have, but I understand I am new and might not be seeing some technicalities. Further I am assuming since an AR seems to be a frowneded upon phrase, and carbine refers to a short barrel/light weapon, a battle rifle I hope is the semi-auto civilian legal proper term. Im not looking for anything for soft shots not planning on hunting, and I dont need anything scoped or bolt action. I think I may be looking for a low caliber, semi auto gun. Fight until you die and drop. A force like ours is hard to stop. Close your mind to stress and pain, fight 'til you're no longer sane. Please check the rules before posting. Many will be happy to contribute to your question, but many find it a drag on their time. quick answer to your long question, get what you want....goto a retailer and ask some questions ( 321 Airsoft is superb..did I say superb? ), hold it, ask more questions, then buy it or move on to your next dream. I think you stumble over the rules, and fell down a hill. Gets yourself up, dust yourself off, and read the rules. I wasn't aware 321airsoft sold real steel weapons. Perhaps in your rush to play backseat moderator you missed what the thread was actually about? For a casual plinker, you cant beat a semiauto .22LR carbine. The ammo is cheap, its fun to shoot, and you can achieve reasonable accuracy out to 150 yards without spending a ton of money. Next step would probably be an AR15 or AK47. I prefer the AR because I'm more familiar with it, and they are a lot more accurate than the AK. Not as powerful or quite as reliable as the AK but for range plinking the power doesn't matter much, and you'll have plenty of time for regular care after you get back from shooting. Ammo for both is readily available and not terribly expensive. Another option in this class might be a Mini-14 or Mini-30. If you want something a little more unique, you could look into the modern repros of the M1 carbine, but the .30 carbine round isn't the best performer or the cheapest. Beyond that there's the "battle rifles", which are longer guns in a heavier caliber. The most common is the M1A, although you see a lot of HK91s and some FALs out there as well. You can also get some of the longer AK style rifles chambered in a .308 cartridge. If you want ridiculous power with ridiculous simplicity and ridiculously low cost, look at older WW1 and WW2 era bolt action rifles. I have a short barreled M44 mosin nagant that puts out a 4 foot fireball for 35 cents a shot and will put a gaping hole in just about anything you like. Picked it up for $75 at a local sporting goods store. I also used to have a full length 91/30 that was cranked out in some basement in Stalingrad in 1942 and probably fired in anger at nazis, so these types of guns are also cool if you are into holding a piece of history in your hands. There's also M1903s in .30-06, K98s in 8mm, and lee enfields in .303. You can usually find most of these rifles for pretty cheap, typically under $200. Reply #1:I am familiar with the rules here, I dont need your reminder. The rule you brought up, I did a search for real steel used the "has this been posted function" and did not see anything to my specifications. Please post something constructive. Reply #3 ( I think) Sorry I was just trying to put all needed information into one post I suppose it got a bit out of hand. I am looking for a Long Gun, Semi-Auto, new long arm shooter friendly. The section highlighted was just me trying to find the correct terminology. I was looking at the AR, an AK would be very cool. I AM A HUGE history buff but this first one need to be reliable. Mrs recon says I have to stay under $400, but I would say up to about $600 tops for my first one. Is there a place I can browse/buy online (the local gunshops dont). I did some research for the AK variant do you mean the Saiga? Last edited by RabidRecon; 10-10-2010 at 08:42 PM. You should get that and then let touch it. This does not help anyone, stop posting. OP: It sounds like with the range you have spending wise it would be smart to look into a .22LR Rifle. Cheap Ammo and Cheap Rifle overall. If you really wanted an AR profile gun I know they are well within your range. Yeah, the Saiga is the most popular .308 AK variant. Honestly it sounds like you are looking for either an AK or AR exclusively, or maybe one of the Minis. The .308 ARs are relatively common, but you likely wont find one in your price range unless its used. If I were you I would keep it in the .223/5.56mm or 7.62x39mm area. .308 and up is nice for longer range stuff, but for plinking inside of 400-500 yards one of the smaller rounds will be a lot cheaper and almost as accurate. 1. Decide on a caliber. I'd recommend .223/5.56mm (there is a difference, which I can go more into if you like), or 7.62x39mm. 2. Decide on a model. AR15, AK47, or Ruger are some of the more common models. There are other types out there though. 3. Figure out a manufacturer. AR15s range from $500-$600 for a base model 16" carbine to multiple thousands of dollars for a high end piston driven gun from a big name company. Beran has given some good info here. If you're looking for a semi-auto tactical rifle chambered for an intermediate cartridge, the AR, AK or Ruger Mini 14 would all be viable options. AR style weapons are going to be the most accurate, but the most expensive. AKs are pretty cheap, but not very accurate. Although an AK chambered in 5.45x39 instead of the more common 7.62x39 will give better accuracy in an AK. They do make Saigas in a 5.56x45 chambering, which might be a good compromise between an AR and AK, but they aren't easy to find. Gunbroker.com would be a good place to look. Have you considered an SKS? Their accuracy is poor, but if you don't plan on shooting much past 100 meters it will do OK, and they are very cheap. Kel-tec may be another brand to research, I have no experience with them, but they make some reasonably priced guns in .223/5.56x45. What kind of effective range do you want from your rifle? i.e., what is the maximum range you will shoot at, and what size target do you want to be able to hit at that range? Last edited by maglips; 10-10-2010 at 10:33 PM. Ooh good call on the SKS and the 5.45mm. I sometimes get tunnel-visioned on the platforms I have the most experience with and forget about some of the bloc's other options. The only issues I might think about with those is limited magazine capacity on the SKS (they make detachable 30rd mags, but all the ones I ever tried wouldn't feed if loaded past fifteen or so) and the availability/price of the 5.45 ammo/rifles/magazines. I haven't ever shot the 5.45, but I've read it performs similarly to the 5.56 nato, with a somewhat flatter trajectory. Okay, as much as you want to be kind and try to avoid the Assault Rifle phrase, it's actually needed. Quick break down, a battle rifle is considered something of heavier caliber, like .308 or 7.62x54r. Good examples are M14, AR10, G3, FAL, SVD. I'm going to go a head and throw all of those out of your price range. At .40-.50 cents around, yeah they're expensive to shoot. Assault rifles are considered lighter caliber rounds, 7.62x39, 5.56x45, 5.45x39 are your basic choices. So right off the bat, I'm going to throw out anything in 5.56x45 caliber. Why? Good 5.56 rounds are still expensive and we're on a budget. Let alone building your own rifle is still going to press your budget. 1k of brass is still about $300 - yes, it's come down A LOT, but it's still expensive. So, that being said you're looking at either 7.62x39 or 5.45x39 caliber. Which, is mostly AK Variants. Not a bad choice for a beginners gun! Now, you can get a brand new converted WASR 10/63 for under $400 out the door. Are they the best AK's ever made? No. They're ones with the 10 round conversion cut off. You might get some trigger slap and mag wobble. It happens, it's an AK. Toss in a K of ammo, and you got about $600 wrapped up in some fun to, always there shooting. So in budget, with ammo. Much more fun then an SKS. Second choice I'll shoot up to you is an AK-74 variant. Little more expensive (normally) however, a little more 'tactical'. Personally, I'm still probably going to buy a Polish made, AK-74 Tantal. (My LMT MRP .308 Project comes first thought.) They run about $400-500, folding wire stock, pretty neat gun over all. Nothing special, but as I said, neat. Even better upside? Clean the barrel and it will shoot anything, including the $100 for 1000 round russian crap from a can ammo. So, it's cheap to shoot; a lot of. Other fun choices are the .22LR versions of guns. Personally I own a GSG-5 and it's a blast to shoot, not accurate at all however. This goes for all of .22 guns basically, until you start talking about building your own, which then for $1000 I'd rather just buy an AR out right. Well I'm in the same market as you, low caliber semi auto gun. Although I am no expert and would recommend heading to the local gun store (much more common than local airsoft) the one which peaked my interest is the S&W M&P15-22. It is a M-4 Clone with full rails but is chambered in .22 LR, making ammunition cheaper. 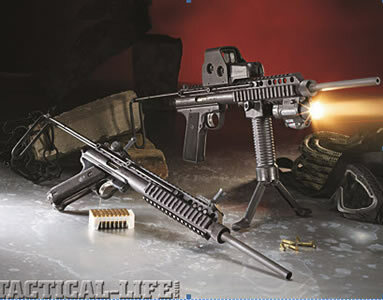 The first link is to the M&P15-22 and the second is to impact guns for your browsing pleasure. From what I have read you must have any fire arm shipped to a licensed dealer and pick it up from them. Another thing to do is check out some real steel forums. I'm sure you will get a lot more information. Also,speak with the people who operate the range you mentioned. I'm sure they will be more than happy to help out a possible future customer. I would try www.gunlistings.org Its kind of the craigslist for real steel. Also, I may have something you would be interested in. I would suggest the AR because .22lr kits are widely avaiable and not that expensive. This basically gives you 2 guns in 1 (kinda). Not to mention the parts support out there for AR's. If you do decide on an AR spend the extra cash on the chrome lined bolt and chamber. 2: I really like this idea, Im a bit confused on the ammo comment, could you clarify? A lot of the "What caliber?, What range?" questions are hard for me because quite simply I am not sure. I know I would like to take it to the range, and I can shoot anything that isnt .50 cal at that location. My research usually makes more questions than answers which is why I appreciate all the help and support I am getting. Recommendations on caliber/range? I am trying to keep it cheap, but as with airsoft none of my hobbies are super cheap. If you're interested in an AK, I would take Fox's advice on the WASR 10. Fox mentioned they can get some trigger slap (this is basically the trigger resetting so hard that it "slaps" your finger). When I bought my WASR 10, I installed a Black Jack recoil buffer that is supposed to help keep the trigger from slapping. I've had mine about 5 years and several thousand rounds, and so far no trigger slap. I can't absolutely credit the lack of trigger slap to the buffer, but they are cheap and super easy to install, it doesn't even require tools. Last edited by maglips; 10-11-2010 at 04:31 PM. Personally, if your looking for a range gun to plinks with, a 10/22 will never fail you. I shoot my dads now and then (I shoot & reload .44 mags through a blackhawk) I recently learned that he hasn't cleaned it in 20 years. I've never seen the thing jam or misfire even with cheap bulk ammo that you can find at gunshows. Considering if you want a tacti-cool rifle, there are options for that. If you want to shoot something bigger, a .223, a mini-14 is reputable from what I hear. You cant fail with Ruger. But if you must have an ak or something, anything will work (Thats how AK's are). Im not sure on 7.62 ammo pricings but Im sure there are some cheap stuff. I can certainly clarify on ammo! I buy enough of it. Okay, http://www.aimsurplus.com/ is kind of hidden in plane sight. I buy a lot of ammo from them, amongst others. ( I have about 5 suppliers I bounce off of, depending on who gives me a nickle per round here, there, etc.) But, AIM's been good, reliable, and always a good selection. Wolf Steel case is pretty much the bread and butter of what you'd shoot through anything like a WASR-10. There is no need to be nice and shoot Brass case ammo out of it, ala an AR variant. It's fairly priced at about 20-22 cents around. It's also *important* non-corrosive. This is where it gets a tad bit tricky. Most 5.45x39 in the US currently, is 'surplus'. Meaning, it pre-dates both you and I combined, in age. It's still good ammo, it works, sealed in a can. Just old. 1000 rounds, $100. Cheap. About as cheap as you can get for a decent caliber. Down side? Being cheap, old surplus stuff, it's also corrosive. Which for the most part, you don't have to worry about. Clean your barrel, get the grime out of there and 99.5% of your corrosion problems will be gone. If you ever do start seeing your rifling wear out, then you'd need to buy a new barrel, which for 5.45x39 mm guns - they're dirt cheap anyways. Now, they also have non-corrosive versions too, ala http://www.aimsurplus.com/product.as...FMJ&groupid=33 (currently sold out) Also cheaper then 7.62x39. If you so decide to go down 5.45 route. If you have any questions, feel free to PM me. In my opinion again, since you're on a budget, you really gotta look at the price of the ammo, not the gun. In example, I'll put it in my recent case. Sure, I'll have nearly $3500 wrapped up in my LMT .308 package before I buy a suppressor for it. However, at say .60 cents a round give or take, that's only about 5800 rounds of ammo for it to equal $3500. Shooting 1-2k a weekend isn't hard at all. So if you're on a budget, make sure not only the GUN fits your budget, but the Ammo does as well. Its why alot of people sell their AR's. Why keep a $1500 gun if you can't afford the $300-400 for a weekend of shooting? Ammo is the expensive part, not the gun. It's the exact opposite of airsoft. I spoke with the local gun shop, they strongly advise against the WASR, they said they are just giving me advice on their opinions, but they have seen the lower quality AKs splinter while someone shoots it. They advise the I.O. Inc AK, as far as AKs go, they advise ARs. Has anyone heard of I.O. Inc? I see very few opinions/ratings compared to Saiga/WASR. Any opinions on the subject? I assume they're saying the stock splinters, is this correct? I've never seen it, and even if it's true, it would be easily remedied by polymer furniture. IO is Inter-Ordnance. i have no experience with them but from what I have heard, they are basically the same as CAIs WASR-10s. EDIT - I just googled "IO AK", and there is a good amount of info about them. Last edited by maglips; 11-04-2010 at 06:13 PM. I was comparing the amount of info the that of the other models. The reputable sources IMO do not account for enough to make an informed choice, most of the gun shops seem to say that IO are cheaply made and have several problems... Misaligned, the grooves are crooked and uneven, the "sight mountings" not sure if thats an accurate term or not, do not align proprerly. The WASR seems to trump it, except its a "century" gun, meaning I guess it was made for 10 rnd mags, and most of the guns were bored out to fit 30 rd, and were done mostly shoddy and causes wobble, so bad even to sometimes misfeed. This is only what I have gathered from reading around and watching videos, not sure whats true and not, it is the internet after all.